The Pioneers needed to keep things clean against a winless Wilmington, and they did. With an 89 to 78 victory over the Wilmington College Quakers, the Men’s Basketball team moves to 5-0 in the Ohio Athletic Conference, and a 10-0 record overall. This comes as the Pioneers gather more Top 25 votes in the D3hoops.com Poll. Freshman Tyler Hammond is really stealing the show, as the Freshman from Cleveland, OH scored 22 points. That’s his second game in a row with 20 or more points. Junior Trevor Halter added 10 more points, and in a surprise, eight rebounds. That’s more than junior Kevin Knab, who usually leads the team in rebounds. He ended the night with 12 points and seven rebounds. The Men’s and Women’s Basketball teams head out for a West Coast swing after the Christmas holiday, then return to face the University of Mount Union and Heidelberg University in the new year. Check out the full Ohio Athletic Conference standings below. Should be an interesting week when Marietta takes on both Capital University and John Carroll University in the same week. A Press Release from Marietta led me to see the Forbes rankings of public and private colleges has been released. Â And Marietta College is now knocking on the top 100 colleges in the country. Marietta was ranked #112 in the country out of all schools that they ranked (the list is out of 600 schools) and, while not officially, ranked within the top 100 private colleges (I say this because they have a list of all the private colleges in the top 100, which is 89 schools, and since I’m not sure which schools are public or private, we are either in the top 100 or #101). In the state of Ohio, Marietta was ranked 4th (Behind #22 Kenyon, #74 College of Wooster, and #88 Oberlin College). In the OAC. Capital was the closest ranked to Marietta. Â They were ranked #138. 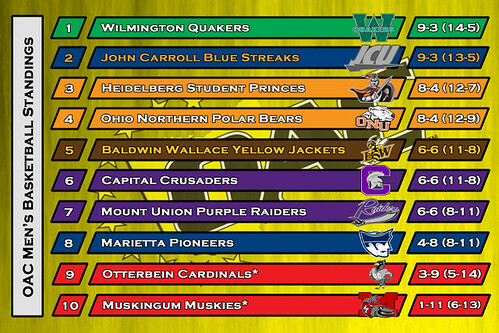 Â Otterbein was #221, John Carroll was #273, Baldwin-Wallace was #335, Mount Union was #481, and Ohio Northern was #570. Â Heidelberg, Muskingum, and Wilmington were not ranked in the Top 600 schools. For comparison, the highest ranked public college in ohio, Miami University in Oxford, OH, was ranked #331. Â The Ohio State University was ranked #361. Â Marietta also outranks all colleges listed on the poll from West Virginia, with Bethany College (WV’s highest ranked school) listed at #164. So in other words, its great to be a Marietta College student. Â And if you’re a high school senior looking to attend one of the best colleges in Ohio, you should check out MC. Check out Marietta College’s Press Release after the jump.